Indigo Metal flake available in 3 Sizes, Micro .004″, Mini .008″ , and Bass Boat .015″ 400 degree temperature threshold. Available in 4 oz. Jars or 1 lb. Bags. 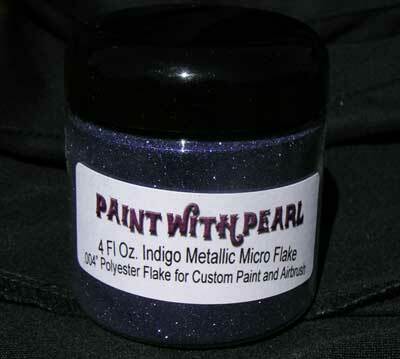 Our Indigo Metal Flake additives are very versatile and can be used in so many applications. Creating a great indigo metal flake paint job is super simple with our flakes. Just choose your base coat (black is good if you want the paint to take on the color of the flakes), and add a heaping tablespoon of our flake to any base clear coat (although we recommend a base clear for mixing the flake into, like PPG’s DBC-500, or HOK’s inter coat clear). Not only are all of our Metal Flakes completely compatible with vehicle dip, we were the first to supply the dip companies with pigments. If you have any reservations about whether our products work in vehicle dip, you should know that we were the pioneers who introduced Plasti Dip Pearls to the world. Our Indigo Metal Flake comes in many sizes, including .004″, .008″, .015″. It has a 400 degree temperature threshold. Is for paint, powder coat, anything. This 25 gram Electric Blue DIY Paint Colors paint and coatings pigment powder is a great pigment for creating your very own tinted clears in paint or powder-coating applications. One 25 gram bag of Electric Blue DIY Paint Colors ® treats from 1 to 2 quarts of clear. 25 Gram Bag(s) of Shimmer Gold Interference Pearl for Nice Flash. 1600ºF Temp Threshold, and good in any Medium of Paint, Powder Coat, Leather Paint, Cosmetics.